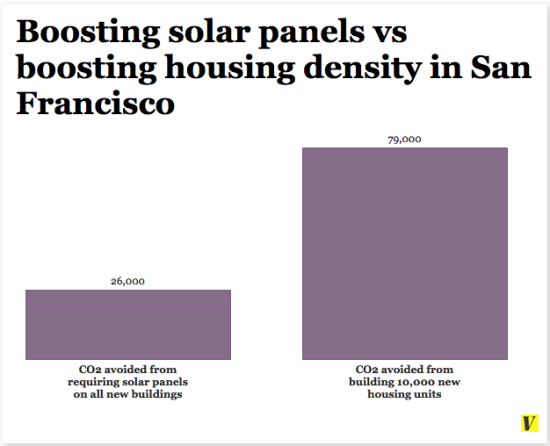 As of this week, San Francisco is the first major American city to mandate solar panels on all new buildings with ten stories or fewer. Researchers calculated that the panels would help avoid the release of 26,000 tons of carbon dioxide each year, the equivalent of removing 5,500 automobiles from the streets. While San Francisco’s move is laudable, it’s actually not the most environmentally friendly move the city could have made. At first pass, solar panels seem like a no-brainer green intervention: the panels are easy to install, produce energy from an infinitely renewable resource, and provide low-cost energy to the user (or offset the energy consumption of a community). A growing body of research suggests, however, that boosting housing density is a more effective climate change-fighting measure than outfitting new buildings with energy-generating devices. San Francisco has byzantine housing regulations that limit the number of units that can be built, and where, constraining the overall size and scale of the city. 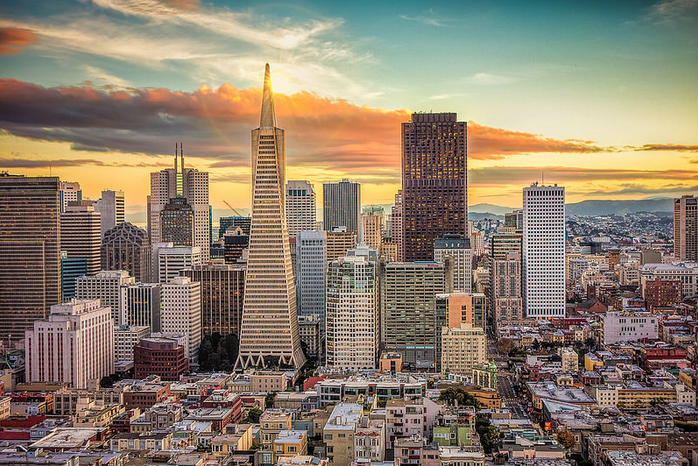 The average San Franciscan emits 6.7 metric tons of CO2 each year, compared to the 14.6 metric tons of CO2 emitted by the average Bay Area resident. People in the city tend to live in apartments, which require less energy to heat and cool, and residents favor public transit over cars, further reducing overall emissions. If the city’s density was increased to accommodate more people, presumably newcomers would adapt to their environment and adopt a less emissions-intensive lifestyle. Brad Plumer at Vox anaylzes the data to show that if, for example, the city of San Francisco built housing to accommodate 10,000 current Bay Area residents (i.e. those living in more wasteful, suburban environments), the city could save 79,000 metric tons of CO2 per year, three times the amount of CO2 that the solar panel legislation could save. If this was applied to the U.S., Plumer reasons, the effect could be tremendous, although decreasing housing costs, along with increasing supply, would be the only way to ensure that green (or green-er) city living is available to a broad range of individuals.